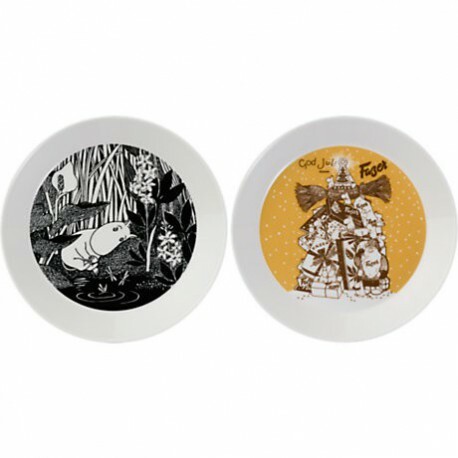 Limited edition plates featuring the illustrations from the Moomin mugs Fazer & Moomintroll dreaming. The designs are based on Tove Jansson's original artwork which Tove Slotte has interpreted in these lovely plates. Limited edition plates featuring the illustrations from the Moomin mugs Fazer & Moomintroll dreaming. The designs are based on Tove Jansson's original artwork which Tove Slotte has interpreted in these lovely plates. Total of 20 different plates will be available in the coming years, the second collector’s edition plate 2-pack, Green & Christmas Greeting, was launched in winter 2014. Plates are manufactured by Arabia and are available limited time only!